Like a fire ball in the sky. 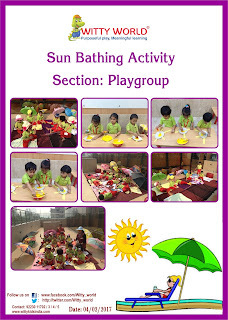 School was more fun than usual for children of the Play group class today, as they spent their day sun bathing under colourful umbrellas, wearing sun glasses and hats, as if they were relaxing by the beach side. On 3rd February 2017, little Wittians of Playgroup enjoyed their Sun bathing activity. Singing Sun Rhymes made the activity more joyful and charming.